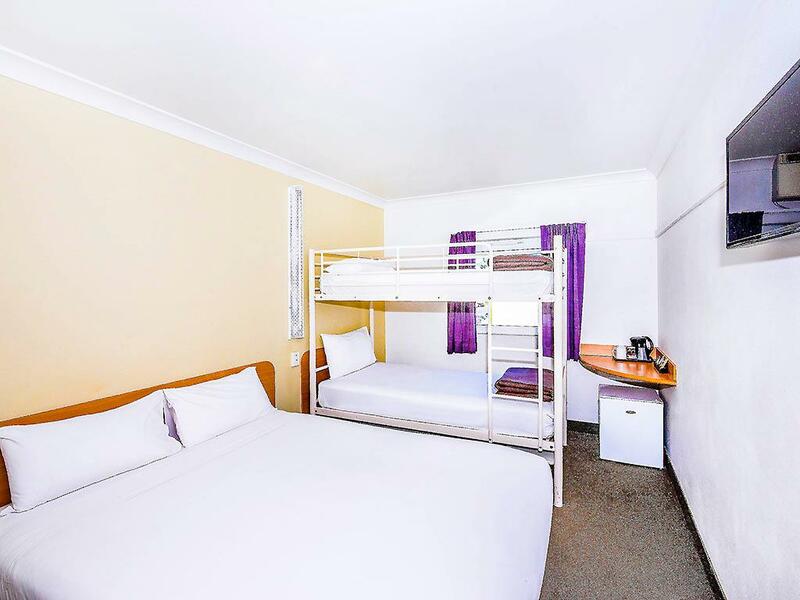 يقع فندق ibis budget Dubbo، المصمم ليناسب كل الضيوف سواء كانوا من رجال الأعمال أو السياح، في مكان ممتاز في أحد أكثر المناطق تفضيلاً في داببو. إن موقع الفندق الاستراتيجي، الذي يبعد 3 km فقط عن مركز المدينة، يسمح للنزلاء بالوصول سريعاً وبسهولة إلى العديد من الوجهات المحلية المثيرة. يضفي محيط الفندق اللطيف وقربه من Dubbo Rotunda Market, سينماس دوبو, اولد دوبي جول سحراً خاصاً على هذا الفندق. 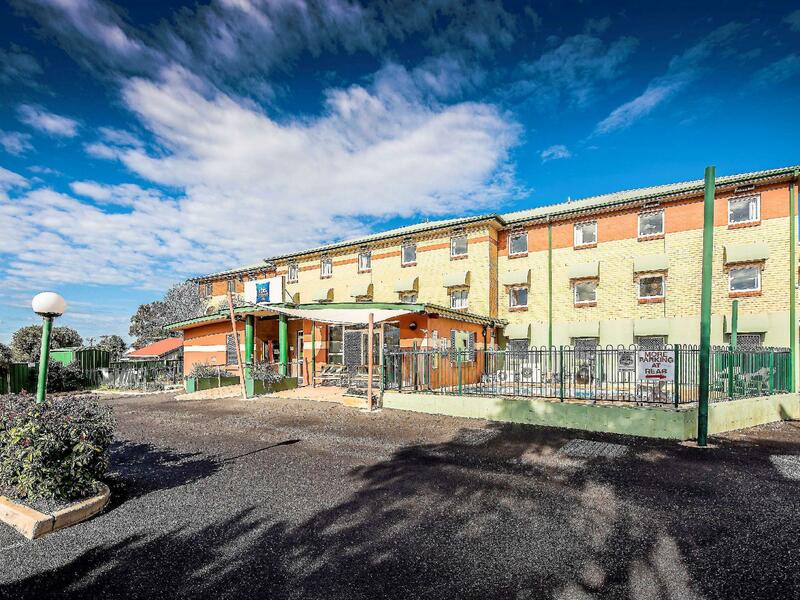 إن ibis budget Dubbo حريص على توفير الراحة للنزلاء، فلا يوفر الموظفون جهداً في تقديم أفضل الخدمات وضمان حسن الاستقبال. يمكن لضيوف الفندق الاستمتاع بالميزات التالية على أرض الفندق: خدمة التنظيف يوميًا, مجهز لذوي الإحتياجات الخاصة, مرافق مخصصة لذوي الاحتياجات الخاصة, واي فاي في المناطق العامة, صف السيارات . ادخل إلى واحدة من الغرف 65 وتخلص من عناء نهار طويل بمساعدة مجموعة كبيرة من الخدمات كمثل تلفزيون بشاشة مسطحة, غرف لغير المدخنين, مكيف هواء, تدفئة, مكتب الموجودة في بعض الغرف. سواء كنت من محبي الرياضة أو كنت تتطلع لتفريغ عناء نهار صعب، ستجد خدمات ذات مستوى عالي بانتظارك كمثل حمام سباحة خارجي, حديقة. إن ibis budget Dubbo هو مكان مثالي للمسافرين الذين يتطلعون إلى الراحة والاستجمام في داببو. We paid less than $100 for a night in a basic room. Although it seemed clean enough to comfortably sleep in the bed, the whole building was tired. Poorly kept on the outside. No lift. Had to carry bags up 2 flights of stairs with no assistance. Air conditioning was VERY loud. This hotel did not meet the usual standard that you would expect from Ibis. A good hotel to stay for a night or two. Staff was friendly, decent rooms, good location. Staff were extremely helpful. very clean. perfect for a one night stay. covers basic needs for a night sleep. room was like cabin with bunk beds. The room was disgustingly filthy. My husband was bitten by a suspected bed bug! Floors were dirty, there was hair on the shower floor, shower curtain was stained with patches of yellow. The bed was hard and sheets felt like sand paper! Reception staff was very friendly. Accor hotels have over engineered this style of hotel. It's sub standard and doesn't reflect the expectations of Australian travellers. 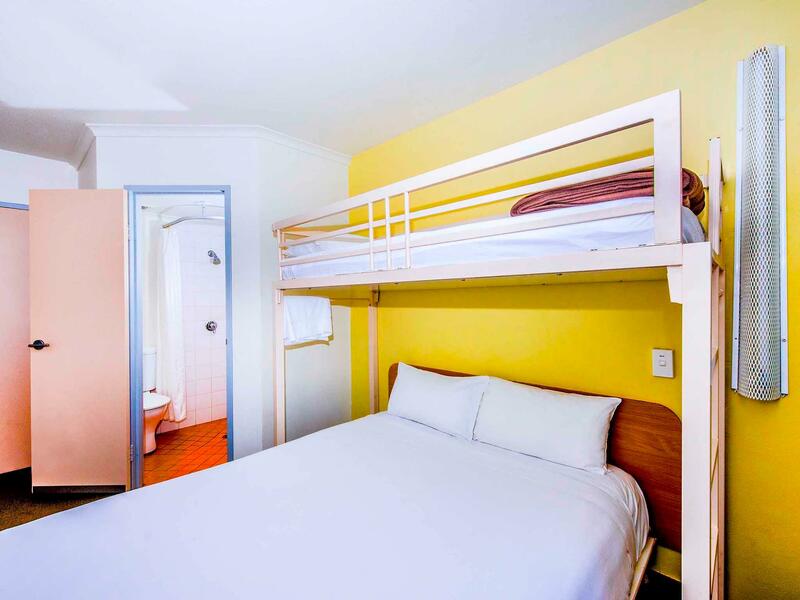 The room is cramped, the bathroom hopelessly designed and the beds, uncomfortable. Start again guys. We found the room to be small but had all we needed for a one night stay. The bedxwas very comfy and extra pillows and blankets were offered. A small fridge, kettle and tea/ coffee in room was a welcome to unwind. A huge ensuite lovely hot water. Next door to Hungry Jacks and a restaurant. Will definately stay again. Thank you staff you were very welcoming and helpful. Perfect stop to visit the zoo. Exactly 9 hours of driving from our house in Brisbane enroute to Melbourne to visit a relative. 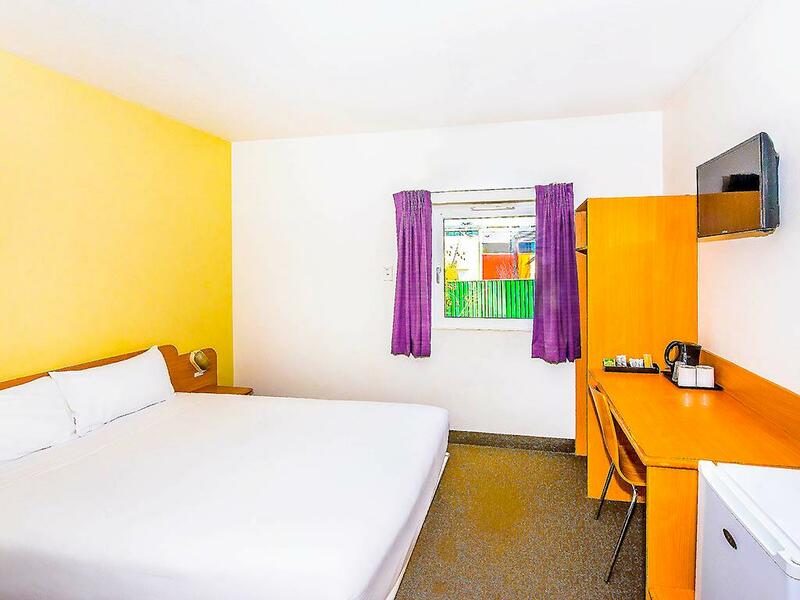 A very good budget hotel to stopover for a night. Heater in the room was working perfect. Tea and coffee provided is more than sufficient. This place is recommendable. Room was so unclean. Live and dead cockroaches in bathroom. Hairs in bathroom when we arrived. Dirty stained carpets. Hairs in bed linen. Woke up with bites on legs and feet. While management were just lovely and kind, the property was so dirty we would never stay there again. it was nice, we came very late (1.30AM) and checked in thru machine in front of front door but machine only gave us 1 room key while we booked for 2 rooms. buzzed the intercom and friendly staff woke up and assisted us very quickly. very happy with the service. but little concern with safety/security. my friend smoke near front door, approached with 3 youngsters and asked for cigarettes. tell them no and 1 of them almost followed him to the hotel entrance. our concern, they shouldnt be able to come to smoking area if they are not hotel guests and at least there should be security patrol around the area.